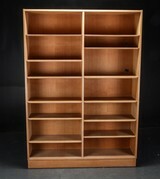 6 drawers - backside with shelves. Original Key included. Beautiful details. Furniture manufacturer Denmark around 1960. 4 drawers on left side and lockable cabinet with shelves and one slim drawer on the right hand side which opens to both sides. This is an utterley charming little piece. 3 drawers on each side. Shelves on the back. Floating top. Amazing grain - just beautiful. Designer unknown. Fully restored to its former glory. 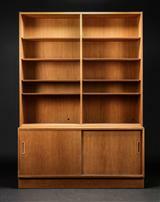 Bookshelf/Bureau/drawers, Teak on Oak frame. Made by Nexø Denmark. Pull out leaf for home desk. Charming little tambour doors in front of drawers and shelves. 3 good size drawers below pull-out leaf. Designed in 1958 by Jørgen Rasmusen and still in production today. Adjustbale back and seat. They are fun and comfortable and very well designed. Danish Vintage OAK desk - made by Omann Jun Mid 1960. Now restored and looking fresh and clean. The pictures here are of the unrestored one. The top is teak with a solid edge. The legs are oak and not original. 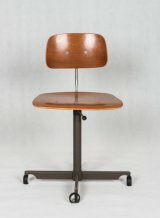 The top reminds us of a fine piece of Finn Juhl. It is impressive and has the wow factor. 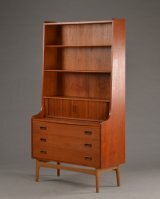 Charming piece with 3 generous drawers under a pull-out leaf. 2 small drawers on the top part. Bell shaped handles. Steel frame laminated top with teak edge. Hooks on either side for shool bags. Age related wear. We have a few of these tables. Made by Poul Hundevad - quality product in very good condition. It does have 2 small holes in the back. Shelves are adjustable.